At the time of writing, coursework deadlines are at their eleventh hour and plenty of students will be burning midnight oil (and giving their teachers sleepless nights) to get projects completed. I used to think it was just me, but my work with schools tells me otherwise. Douglas Adams was notorious for being late with his copy to publishers and once said; ‘I love deadlines – it’s the wonderful whooshing noise they make as they fly past’. At TechSoft, we are always open to helping students directly and this year I got a call from Malcolm Cross, Head of Product Design at Peter Symonds College in Winchester. One of his students had missed time through illness and now needed parts 3D printed to complete his project. I liaised directly with Nathan and he was able to email me the .stl files – all 80 of them! They turned out all to be tiny parts so it was easy to nest them and run off just a few batches over the weekend. What was really impressive was Nathan’s use of SolidWorks to create his project idea and the necessary files for printing. 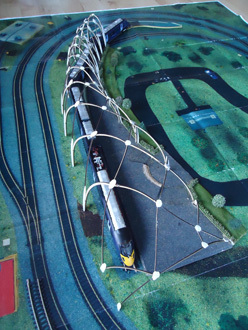 Nathan’s brief was to design a railway terminus and produce a model in standard scale. 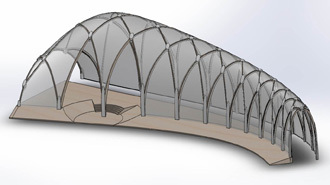 His SolidWorks model enabled 2D dxf files to be extracted for laser cutting ribs in thin plywood. Nathan also produced 3D files in .stl format for all the bosses needed to connect the ribs at their intersections. This was clearly emulating techniques used by contemporary leading architects. Zaha Hadid’s flowing organic forms (think Olympic Aquatic Centre) defy convention by using the complex geometry that only CAD can sensibly provide at this scale. Because the building ‘works’ in CAD, the parts produced off-site from the CAD files will have the necessary precision to assemble with accuracy. Peter Symonds College always maintain their subscription to SolidWorks so that all their Product Design students have access to the home use licence which allows them to work and learn at home. This was critical to Nathan’s success. We are sure that Nathan has a bright future at University (Architecture –what else?) but getting this good at using the software is not simply a means to get good exam grades. He will have an impressive portfolio to present at interview, but taking things further could securethe interview in the first place. Every SolidWorks Education Edition which is in subscription provides students with free access to the Certified SolidWorks Associate (CSWA) examination. Preparation need not be onerous and a student like Nathan will probably be covering the ground already. The School or College has to register for the exam and then obtain ‘vouchers’ (effectively PIN codes) for students wishing to enter. The exam has a three hour time limit and is taken on-line at whatever time or date suits. CSWA Tutorials are built into the SolidWorks desktop and plenty more are available for download. As competition for jobs and university places gets more and more competitive, a CSWA certificate alongside GCSEs and ‘A’ levels will make any student stand out from the crowd.Employers and admission officers will recognise the blue-chip credentials of SolidWorks and understand CSWA as a highly credible measure of competence. 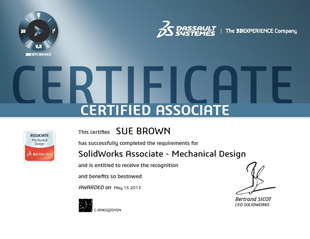 For more information about SolidWorks and the CSWA exam contact TechSoft on 01745 535007.